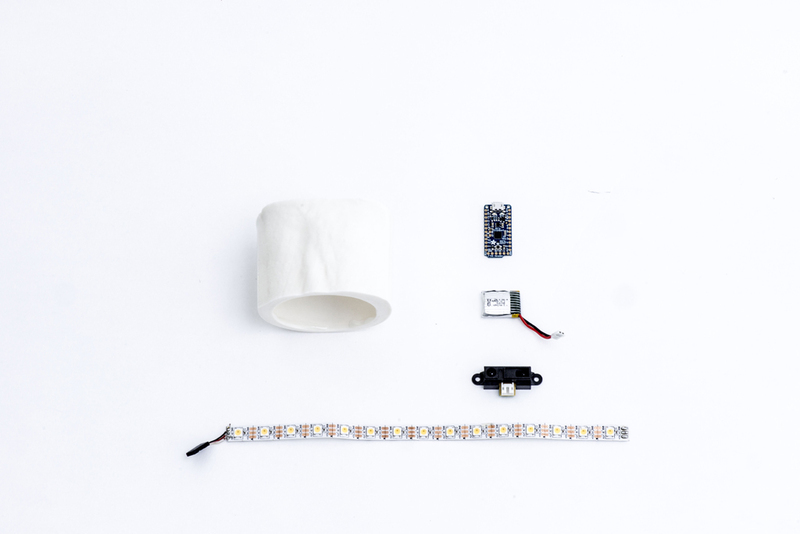 * Explorative experimentation and conceptualisation. * Explorative outcome. There are two core concepts as outcome of the exploration. Object 1: pattern “flower of life” projected on the neck. 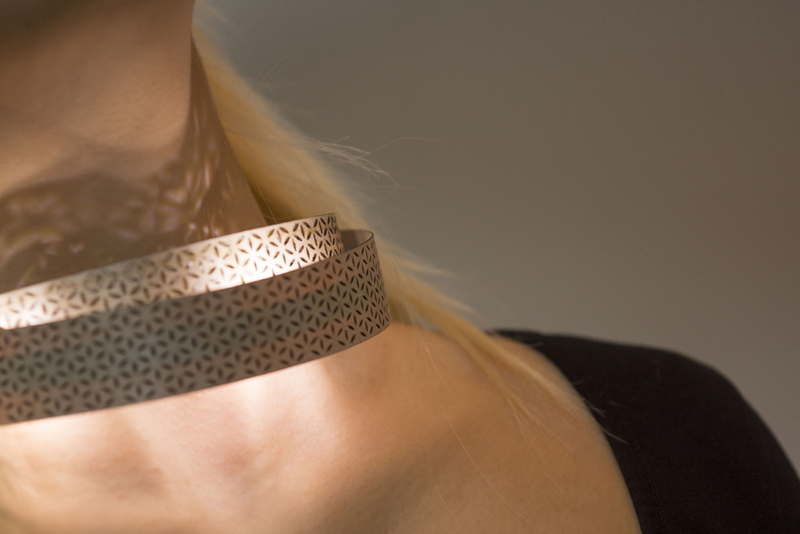 This object is a neckless that projects a designed pattern on the wearer’s neck. 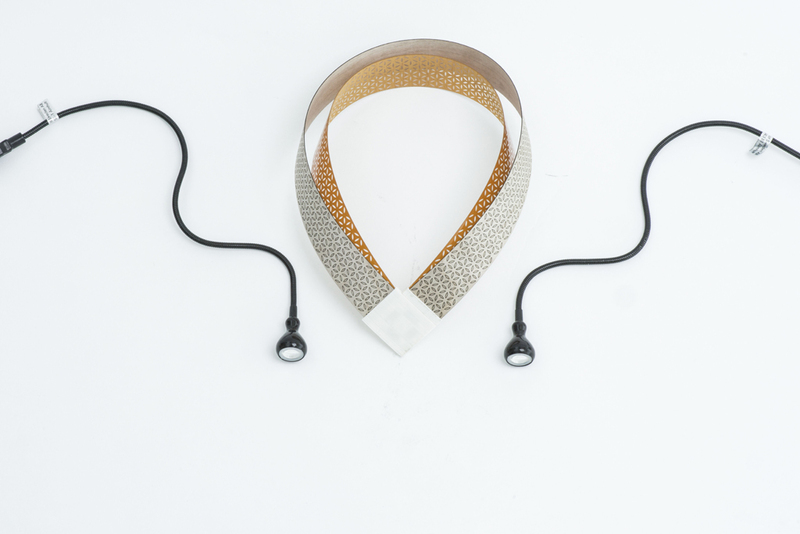 The pattern is called “follower to life”, it moves around the neck faster or slower depending if the neck’s proximity sensor detects some other object or person nearby. The role that plays the light here is to give life to the “flower of life” engraved on the physical piece. 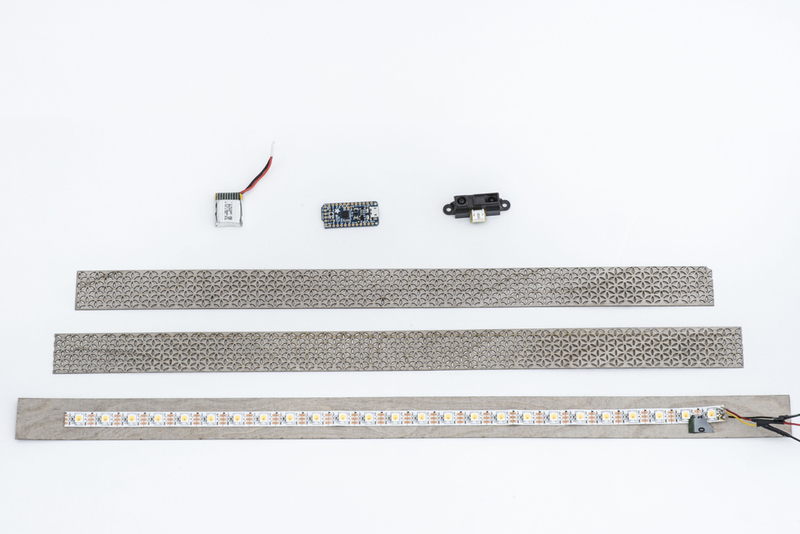 The led strip is commanded by a micro controller which simultaneously receives data from the proximity sensor. Object 2: pattern “flower of life” projected on the chest. Same as the object 1, this piece of jewellery is a neckless, here the pattern “flower of life” is projected over the chest. 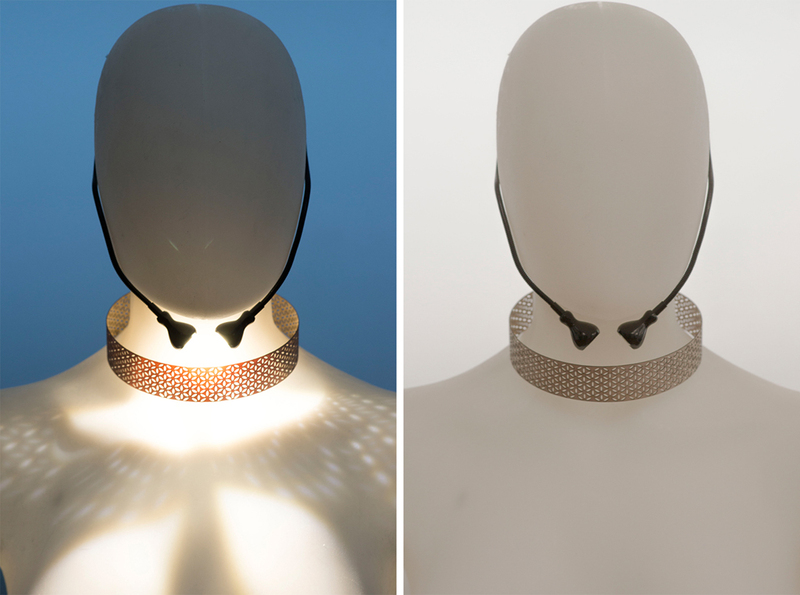 The light source is not in side the object, which means that the light comes from outside; it can be wore on ears or shin as a second accessory for the wearer. Once the pattern is projected on the chest will change its position along it according to the motion of the wearer’s head. 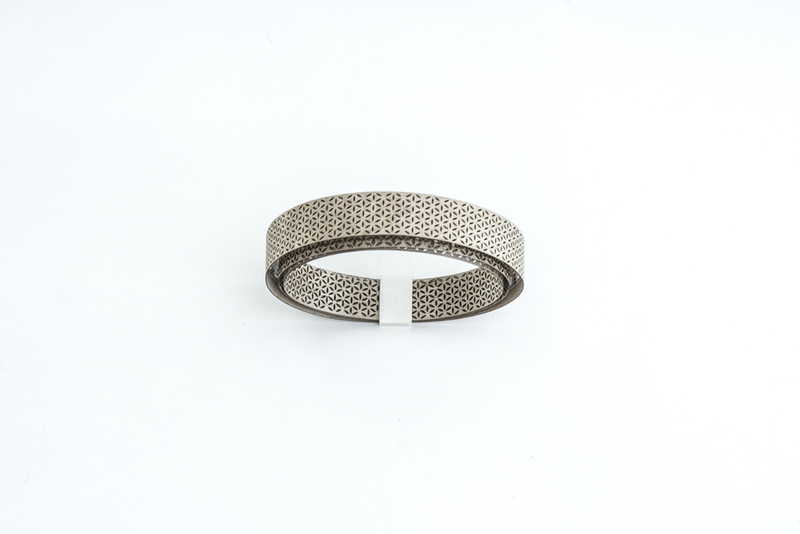 Object 3: enlightened scars on a ceramic bracelet. This singular jewellery piece made out of ceramic is distinguished for housing a person’s marks or scars. Light is used to fill out those life’s tracks embodied on the piece. The status of the object is raised up to a higher level, its represents a meaningful memento in the wearer’s life. 3d scans were made from a person’s body skin marks, which afterwards were 3d modelled to become the surface and texture of the bracelet. If the hand that wears the bracelet is grabbed or cuddled the light inside the jewell changes its brightness.